The professional software package for chimney calculations in accordance with BS EN13384. With kesa-aladin you can calculate many configurations such as a masonary domestic chimney for solid fuel through to a complex plant room with five condensing boilers. 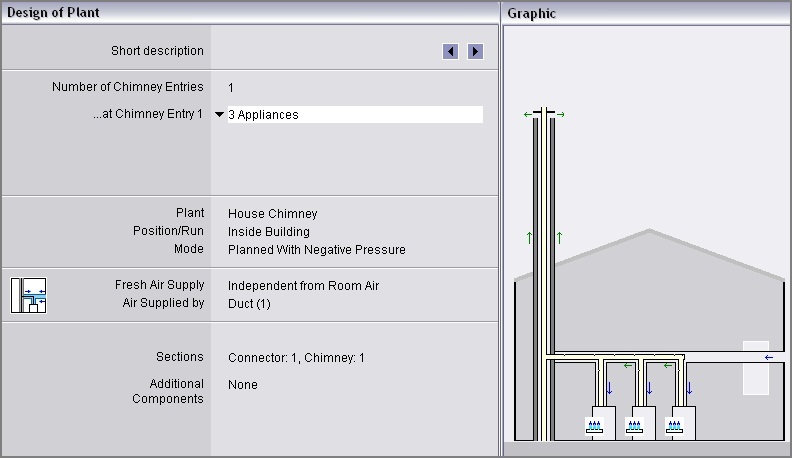 Professional computer software such as kesa-aladin enables installers and engineering consultants to run different chimney possibilities and prove that a chimney system will meet with BS EN13384. See here for more information about using kesa-aladin to calculate to this standard. This process benefits from the convenience of having manufacturers' details available in a digital database alongside the calculation. Pressure requirements. This ensures that the pressure in the chimney is sufficient to transfer the exhaust gases to the outside safely. Temperature requirements. This ensures that the chimney has long-term protection from damages caused by condensation, and that the outlet does not freeze if outside temperatures are very low. There are four program options to suit all needs and budgets. Chimney systems with a single appliance. Chimney systems with up to five appliances. Five fireplaces in cascade or with a common collection flue pipe. Chimney systems with up to ten appliances. Nine fireplaces in cascade or with a common collection flue pipe. Chimney systems with up to twenty appliances. The initial program prices require the addition of 12 months of software maintenance. The final offer price may include additional months. This maintenance permits program and database updates using the LiveUpdate function. After the first year there will be the option to extend this maintenance and ensure you always use the current version. Combustion Air calculation is already included in the Standard and Professional verions. It is also an optional extra for Light and Sinlge Appliance. Soot fire resistance test examines the temperatures of the chimmney layers during a soot fire. Stoves with ceramic heating gas flues is another option. The programs include almost 40,000 products, including fireplaces, chimney-systems, pots, nozzles, fume suction systems (top fans), dampers, stroke limiters (secondary air equipment), reflux safety devices, downstream heat exchangers and many more. Databases are updated regularly under the software maintenance, as detailed above. All prices shown without tax.